Funeral services for Celia “Sally” Guerrero, age 85, of Oyster Creek, TX will be held at 11:00 a.m. on February 6, 2019 at Lakewood Funeral Chapel with Pastor Jeff McDonald officiating. Interment will be held at Restwood Memorial Cemetery. The family will receive friends at Lakewood Funeral Chapel at 10:00 a.m. on February 6, 2019. Sally was born on June 30, 1933 and passed peacefully on February 2, 2019. She lived to cater to her adoring husband, six children and all of her grandchildren, great-grandchildren and great great-grandchildren. Sally had a laugh that would fill a room and was always dressed for a party. She has accepted the heavenly invitation to her final and fantastic party in the sky. 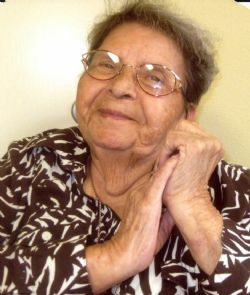 Survivors include her husband, Rudolfo “Rudy” Guerrero Sr. of 67 years; children, Mary Helen Guerrero, Rudy Guerrero Jr., Kay Guerrero, Jerry Guerrero, Lisa Guerrero, Shirley Ann Rivera, John Venne, Abe Guerrero, Sally Ann Guerrero and 15 grandchildren, 28 great-grandchildren and six great great-grandchildren. She forever loved her brothers and sister as well as all of her nieces and nephews. Pallbearers will be Abe Guerrero, Raymond Clements, Rudy Guerrero III, Xavìer Guerrero, and Andrew Joshua Austin.